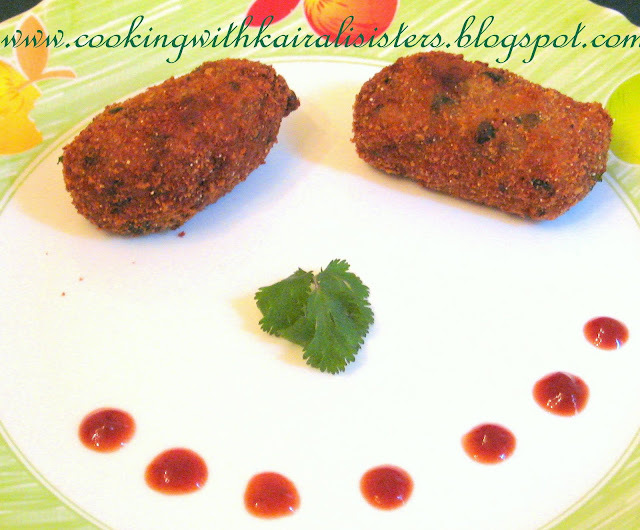 Vegetable cutlet is a comfort food, a good one especially during winter times. It is quite easy to make. Here goes the recipe. This will make 20-25 cutlets. You can also use any other vegetables like beetroot and beans if you like. Cut the potatoes into half (with skin) and cook in a pressure cooker with required water till it is cooked well. We waited for 2 whistles. Remove the skin when cooked and mash the potatoes with a spoon. Remember not to mash it too well. Small chunks of potatoes should be there in the mix. Similarly, cook the peas and carrot well. You can pour little water in a bowl and do this in a microwave as it is easier that way. Keep the cooked vegetables ready. Take a deep bottomed pan, pour oil. When oil starts to sizzle, drop in the fennel seeds followed by cumin seeds. Now sauté the finely sliced red onions. When the onions starts to wilt, add the ginger garlic paste and the green chillies. Let this cook well. Add all the masala powders and parsley flakes. Hold up on the garam masala. Let the masala powders cook well and wait till you get a whiff of masala smell. Stir in the cooked vegetables and mix everything well. Add the lime juice, required salt and the garam masala powder. After a few minutes, drop in the chopped cilantro leaves. Switch off the gas, the mix is ready. Take bread crumbs in a flat plate and the egg wash in another plate. Scoop lemon sized ball of the mix in your hand and shape it into an oval shape using your hand. Drop the mix first into the egg wash and then into the bread crumbs. Make sure to cover the mix with bread crumbs on all sides. Similarly, prepare cutlets using the entire mix. Place the prepared cutlets in a plate and cover it using plastic wrap. Place the cutlets inside the fridge for at least 30 – 45 minutes. Once cooled, the cutlets become firm. This way the cutlets will not soak up too much oil. Now heat the required amount of oil in a kadai for frying and drop in the cold cutlets. Keep the heat at medium while you fry the cutlets. Deep fry until cutlets are golden brown. Now remove it and place it on tissue paper to soak up extra oil. Enjoy yummy cutlets. We would recommend you to enjoy the cutlets when they are slightly cooled to get the real taste of it. I make veg cutlet in a different way.lemme try this out and will let you know guys.looks delicious !!! Cutlet looks fantastic and really crispy, lipsmacking here.. Such a cute click looks delicious. Yummy cutlets! Love it have this any time of the day... Great presentation! LOoks soooooooooooooooooooooo tempting almost everyone fav snack.. Very crispy and yummy, loved by everyone! brilliant are the pics & the method!!! thanks for sharing the recipe of one of my most favorite snack. I want to try this out! njan undakkunnathu same way aanu.pakshe shallow fry... but i usually dont get this texture!:(.. except that i dont keep it in refrigerator for a while...i have to try that trick now.